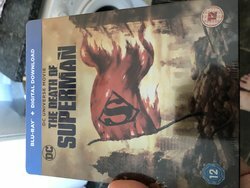 For the guys ‘n’ gals who have watched this is it worth the purchase of a steelbook release? as I quite enjoyed the last entry into the DC Universe Animated Original Movies - Suicide Squad : Hell to Pay. Is this the same movie as Doomsday? Or is this a new movie? My mistake. I searched for 'Death of Superman' on their site and it came up with 3rd party sellers, not their own listing. Still, they've limited to 3 per customer which usually means they're running low. Arrived today. Really happy with this. Nice looking steel. Yep, Amazon has charged and now says preparing for dispatch. Arrived yesterday . . . it's OK but nothing to get too excited about. Just finished making a video for this one incase anyone wants to see it before they buy it. That back artwork with gloss looks amazing. It does. I really like this steelbook.